En la U. N. sede Bogotá se realizará la conferencia inaugural del Coloquio del Departamento de Física. The essential conundrum of modern biology, namely the question of how life emerges from myriad molecules whose behaviour is governed by physical law alone, is embodied within a single cell—the quantum of life. The rise of scientific supercomputing has allowed for the study of the living cell in unparalleled detail, from the scale of the atom to a whole organism and at all levels in between. In particular, the past three decades have witnessed the evolution of molecular dynamics simulations as a "computational microscope", which has provided a unique framework for the study of the phenomena of cell biology in atomic (or near-atomic) detail. 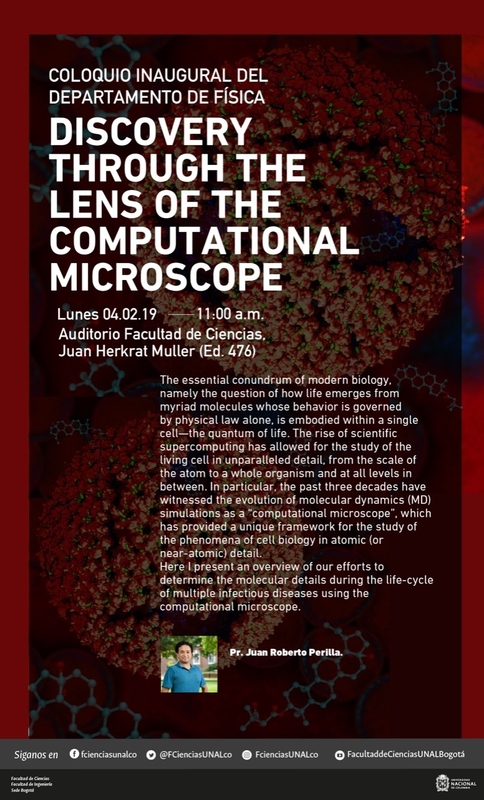 Here I present an overview of our efforts to determine the molecular details during the life-cycle of multiple infectious diseases using the computational microscope.